I thought this might be a good opportunity to give a small status update of what has happened since my last blog post nearly a year ago. The biggest news is that VkRunner is now integrated into Khronos’ Vulkan CTS test suite and Mesa’s Piglit test suite. This means that if you work on a feature or a bugfix in your Vulkan driver and you want to make sure it doesn’t get regressed, it’s now really easy to add a VkRunner test for it and have it collected in one of these test suites. For Piglit all that is needed is to give the test script a .vk_shader_test extension and drop it anywhere under the tests/vulkan folder and it will automatically be picked up by the Piglit framework. As an added bonus, these tests are also run automatically on Intel’s CI system, so if your test is related to i965 in Mesa you can be sure it will not be regressed. On the Khronos CTS side the integration is currently a little less simple. Along with help from Samuel Iglesias, we have merged a branch into master that lays the groundwork for adding VkRunner tests. Currently there are only proof-of-concept tests to show how the tests could work. Adding more tests still requires tweaking the C++ code so it’s not quite as simple as we might hope. When VkRunner is built, in now also builds a static library containing a public API. This can be used to integrate VkRunner into a larger test suite. Indeed, the Khronos CTS integration takes advantage of this to execute the tests using the VkDevice created by the test suite itself. This also means it can execute multiple tests quickly without having to fork an external process. The API is intended to be very highlevel and is as close to possible as just having simple functions to ask VkRunner to execute a test script and return an enum reporting whether the test succeeded or not. There is an example of its usage in the README. One of the concerns raised when integrating VkRunner into CTS is that it’s not ideal to have to run glslang as an external process in order to compile the shaders in the scripts to SPIR-V. To work around this, I added the ability to have scripts with binary shaders. In this case the 32-bit integer numbers of the compiled SPIR-V are just listed in ASCII in the shader test instead of the GLSL source. Of course writing this by hand would be a pain, so the VkRunner repo includes a Python script to precompile a bunch of shaders in a batch. This can be really useful to run the tests on an embedded device where installing glslang isn’t practical. However, in the end for the CTS integration we took a different approach. The CTS suite already has a mechanism to precompile all of the shaders for all tests. We wanted to take advantage of this also when compiling the shaders from VkRunner tests. To make this work, Samuel added some functions to the VkRunner API to query the GLSL in a VkRunner shader script and then replace them with binary equivalents. That way the CTS suite can use these functions to replace the shaders with its cached compiled versions. The requirements section can now contain the name of any extension. If this is done then VkRunner will check for the availability of the extension when creating the device and enable it. Otherwise it will report that the test was skipped. A lot of the Vulkan extensions also add an extended features struct to be used when creating the device. These features can also be queried and enabled for extentions that VkRunner knows about simply by listing the name of the feature in that struct. For example if shaderFloat16 in listed in the requirements section, VkRunner will check for the VK_KHR_shader_float16_int8 extension and the shaderFloat16 feature within its extended feature struct. This makes it really easy to test optional features. I spent a fair bit of time making sure VkRunner works on Windows including compiling with Visual Studio. The build files have been converted to CMake which makes building on Windows even easier. It also compiles for Android thanks to patches from Jaebaek Seo. The repo contains Android build files to build the library and the vkrunner executable. This can be run directly on a device using adb. 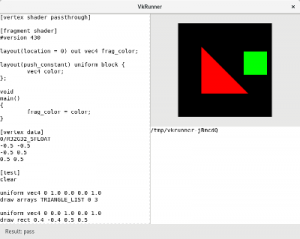 There is a branch containing the beginnings of a user interface for editing VkRunner scripts. It presents an editor widget via GTK and continuously runs the test script in the background as you are editing it. It then displays the results in an image and reports any errors in a text field. The test is run in a separate process so that if it crashes it doesn’t bring down the user interface. I’m not sure whether it makes sense to merge this branch into master, but in the meantime it can be a convenient way to fiddle with a test when it fails and it’s not obvious why. Lots of other work has been going on in the background. The best way to get to more details on what VkRunner can do is to take a look at the README. This has been kept up-to-date as the source of documentation for writing scripts. As part of my work in the graphics team at Igalia, I’ve been helping with the effort to enable GL_ARB_gl_spirv for Intel’s i965 driver in Mesa. Most of the functionality of the extension is already working so in order to get more test coverage and discover unknown missing features we have been working to automatically convert some Piglit GLSL tests to use SPIR-V. Most of the GLSL tests are using a tool internal to Piglit called shader_runner. This tool largely simplifies the work needed to create a test by allowing it to be specified as a simple text file that just contains the required shaders and a list of commands to execute using them. The commands are very highlevel such as draw rect to submit a rectangle or probe rgba to check for a specific colour of a pixel in the framebuffer. A number of times during this work I’ve encountered problems that look like they are general problems with Mesa’s SPIR-V compiler and aren’t specific to the GL_ARB_gl_spirv work. I wanted a way to easily confirm this but writing a minimal test case from scratch in Vulkan seemed like quite a lot of hassle. Therefore I decided it would be nice to have a tool like shader_runner that works with Vulkan. I made a start on implementing this and called it VkRunner. If this is run through VkRunner it will convert the shaders to SPIR-V on the fly by piping them through glslangValidator, create a pipeline and a framebuffer and then run the test commands. The framebuffer is just an offscreen buffer so VkRunner doesn’t use any window system extensions. However you can still see the result by passing the -i image.ppm option which cause it to write a PPM image of the final rendering. The format is meant to be as close to shader_runner as possible but there are a few important differences. Vulkan can’t have uniforms in the default buffer and there is no way to access them by name. Instead you can use a push constant buffer and refer to the individual uniform using its byte offset in the buffer. VkRunner doesn’t yet support UBOs. The same goes for vertex attributes which are now specified using an explicit location rather than by name. In the vertex data section you can use names from VkFormat to specify the format with maximum flexibility, but it can also accept Piglit-style names for compatibilty. VkRunner supports some extra features that shader_runner does not. Firstly you can specify a format for the framebuffer in the optional [require] section. For example you can make it use a floating-point framebuffer to be able to accurately probe results from functions. If you want to use SPIR-V instead of GLSL in the source, you can specify the shader in a [fragment shader spirv] section. This is useful to test corner cases of the driver with tweaked shaders that glslang wouldn’t generate. You can get a base for the SPIR-V source by passing the -d option to VkRunner to get the disassembly of the generated SPIR-V. There is an example of this in the repo. Although it can already be used for a range of tests, VkRunner still has a lot of missing features compared to shader_runner. It does not support textures, UBOs and SSBOs. Take a look at the README for the complete documentation. As I have been creating tests for problems that I encounter with Mesa I’ve been adding them to a branch called tests in the Github repo. I get the impression that Vulkan is somewhat under-tested compared to GL so it might be interesting to use these tests as a base to make a more complete Vulkan test suite. It could also potentially be merged into Piglit. UPDATE: Patches to merge VkRunner into Piglit have been posted to the mailing list.